The Dakota lodges pictured above were at Fort Snelling during 1862 - 1863 after the Sioux uprising. These were located on the river bottoms inside a log stockade where the Dakota prisoners were kept. Burial scaffold used by the Dakota. 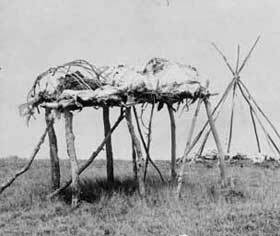 The dead were wrapped and placed on elevated platforms along with their possessions. A burial scaffold was located at Pond-Dakota Mission Park where the parking lot now stands. This area was primarily occupied by the Dakota who had been displaced by the Ojibwa. The Dakota in turn pushed the Iowa south. I-ca-hta-ka-the, the Dakota Indian name for Bloomington, means where the water touches the bluffs. Indian tribes lived in villages on this land along the Mni-sota river. 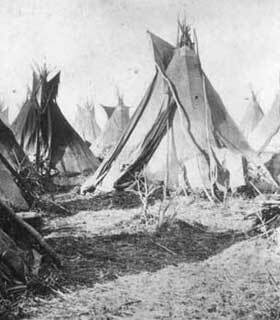 Sustained with an abundance of available food, they lived in bark lodges and tipis, hunted wild game and birds, fished the rivers, planted and cultivated their crops. In the 1700s and 1800s, French fur traders moved in, followed by American and English traders. The tribal communities began to use European or American implements. In 1805 the Dakota Indians signed the first land treaty with explorer Zebulon Pike who had been hired by the U.S. Government to search for a location for a fort. With the establishment of Fort Snelling at the confluence of the Mississippi and Minnesota rivers, the settlement of the area by Euro-white Americans began to accelerate.